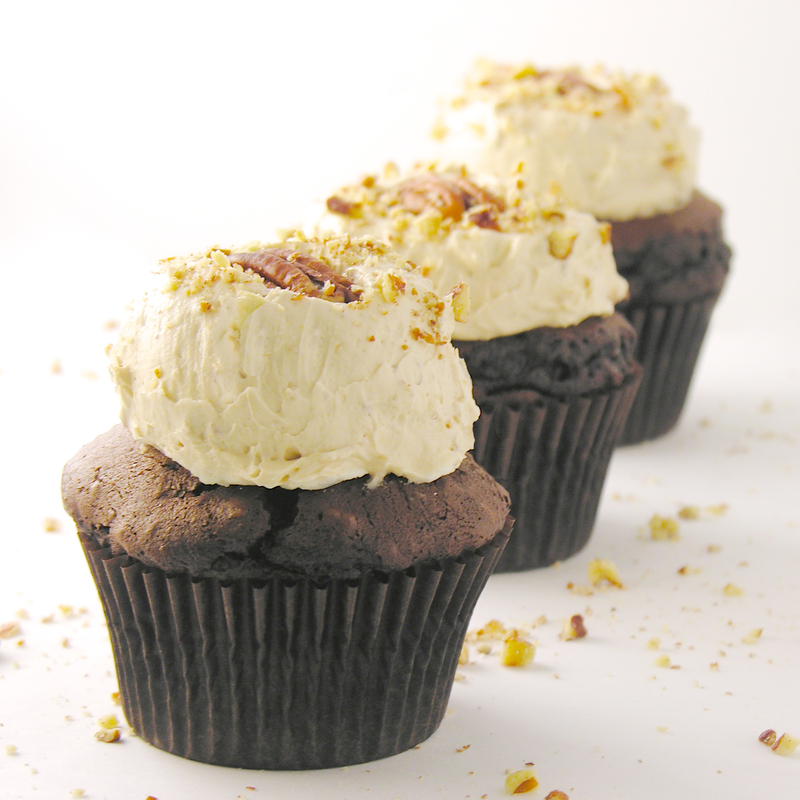 Dense chocolate brownie cups topped with fudge and a dome of creamy peppermint topping! 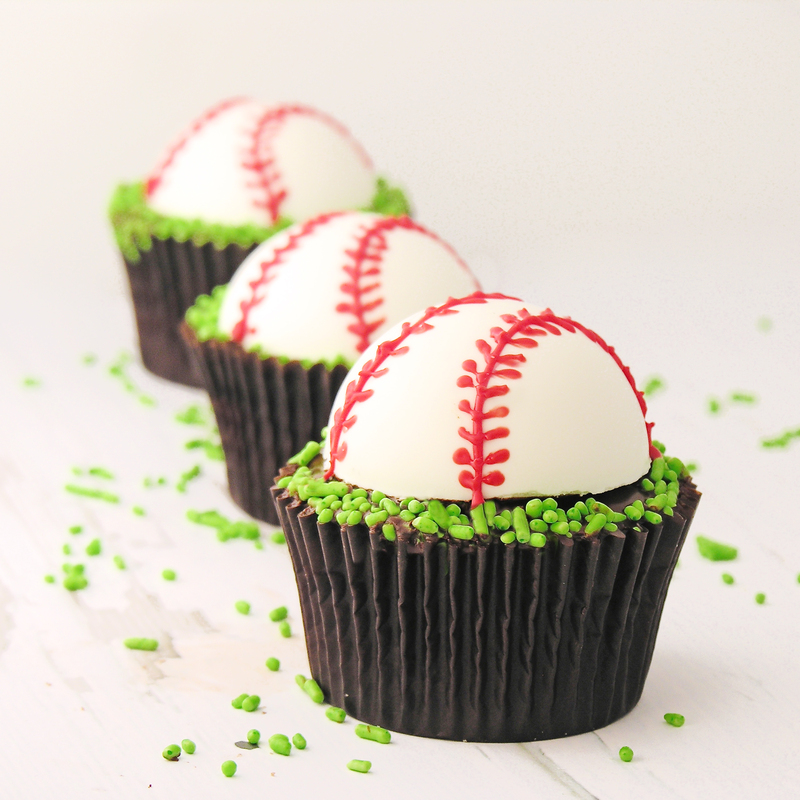 These baseball brownies are a perfect idea for Father’s Day! 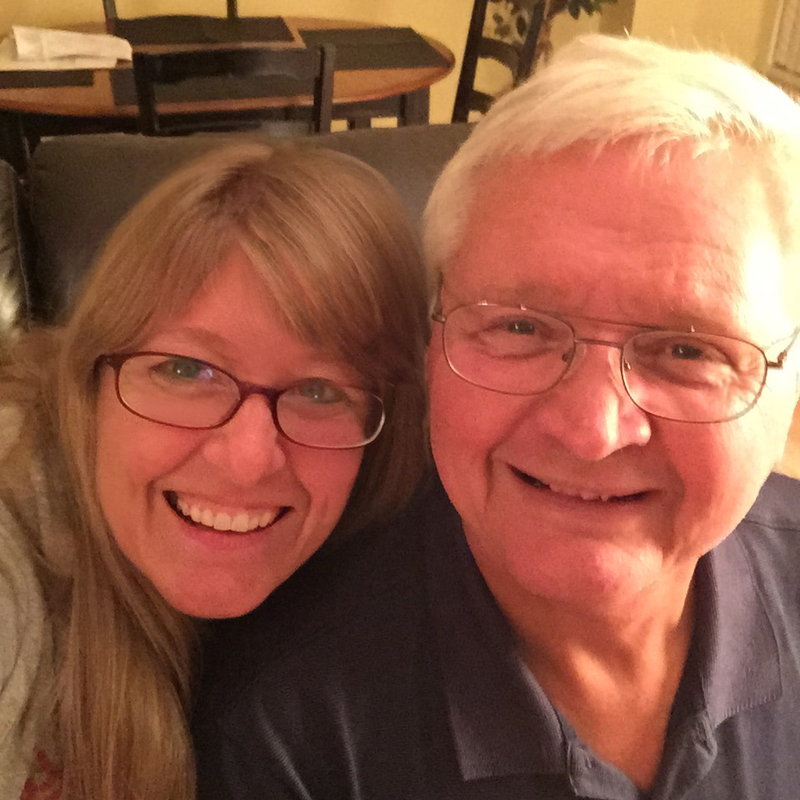 Our day to celebrate dad is almost here! I happen to have a pretty incredible dad. By the time this posts he will be in Canada fishing with my uncles and cousins (does Father’s Day get better than that??) 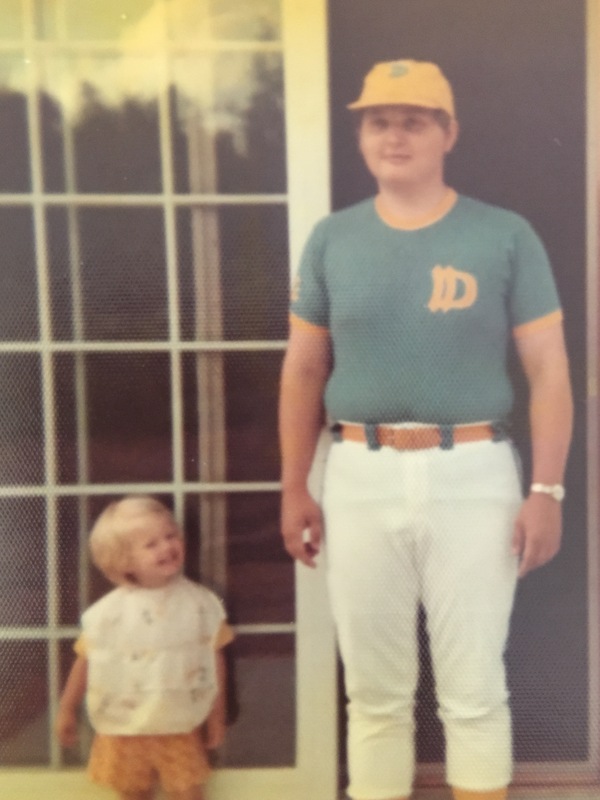 I’ve celebrated all of his various hobbies over the years…fishing, golfing, football (watching), setting off epic firework shows… but I hadn’t made anything baseball. Until now. 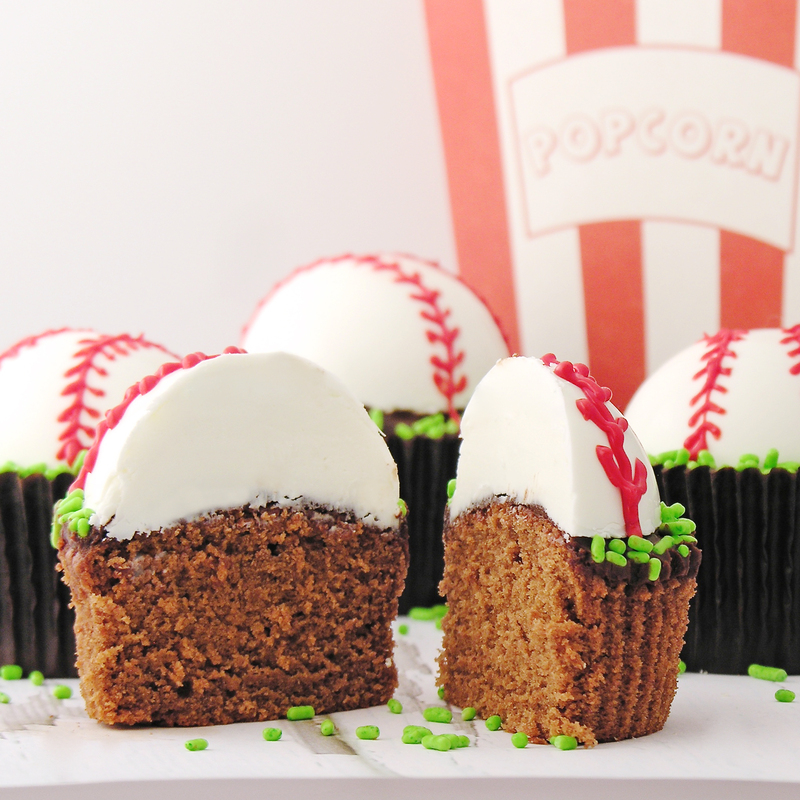 Let me introduce to you, the YUMMIEST baseballs you will ever meet! Seriously- they are almost too cute to eat!! 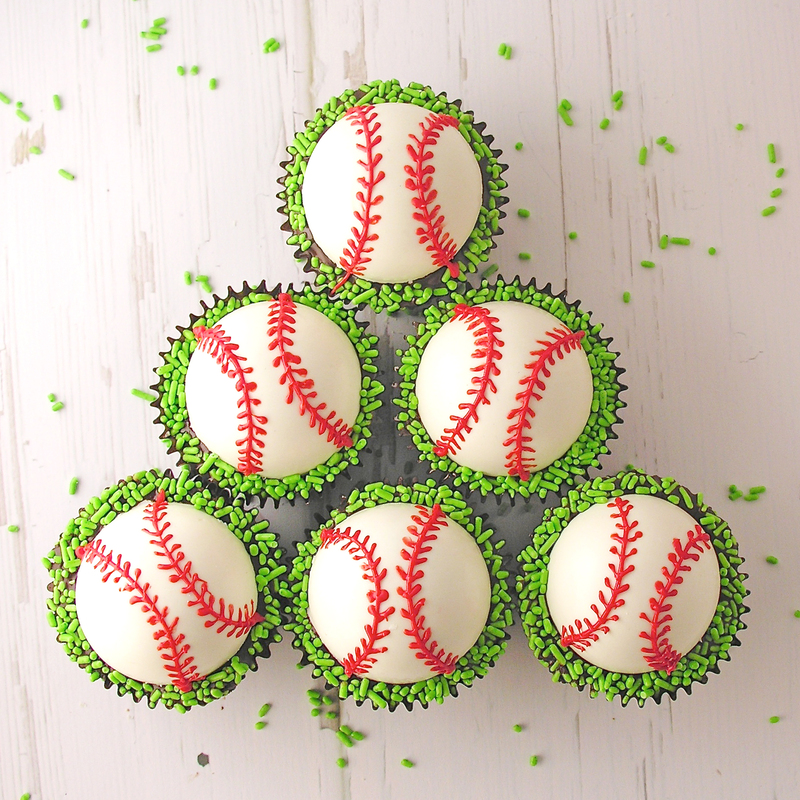 Now, these look difficult to make. Let me assure you that they are not- until you pipe those little laces on top. Then, if you have shaky hands like me, these are AGONY. Just being honest. 🙂 If you have a steady hand (or have a friend to help) you will zip through that piping like nothing though! Promise. 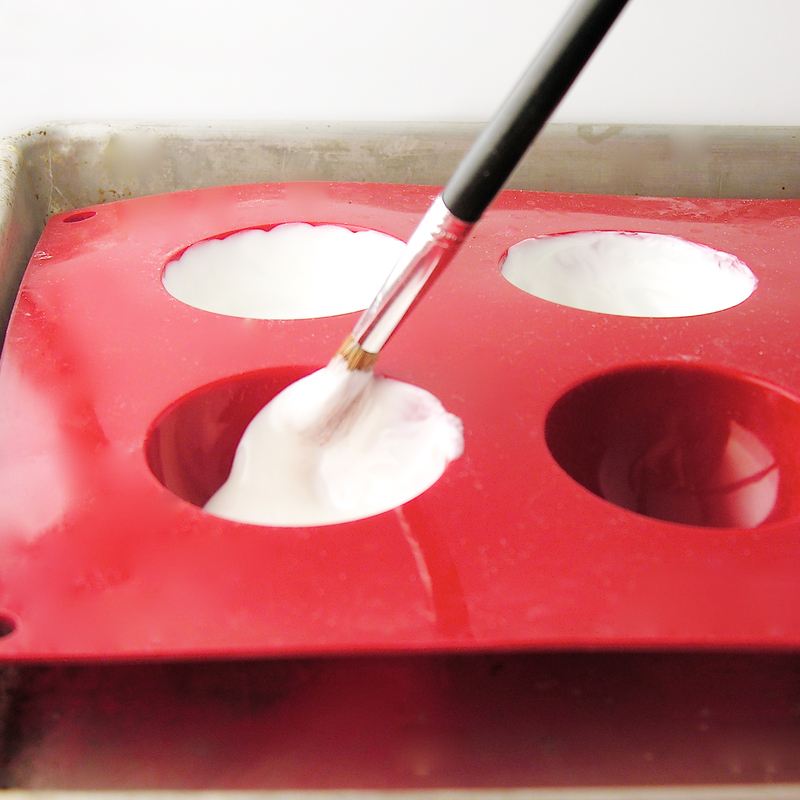 About 1/2 cup of Wilton’s Candy melts in red. 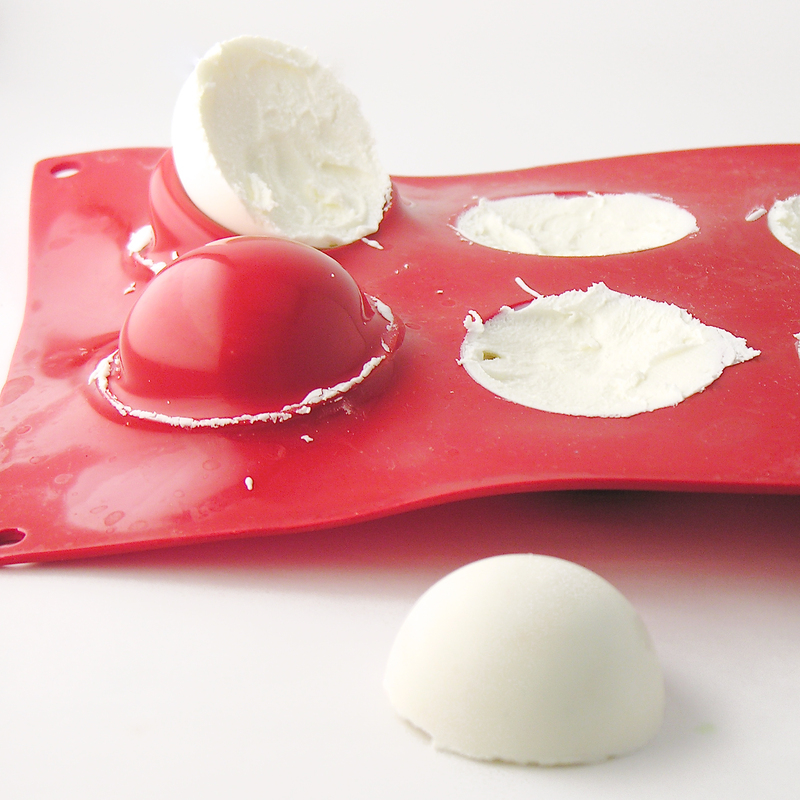 Melt white candy melts in microwave in 30 second increments, stirring between until smooth. 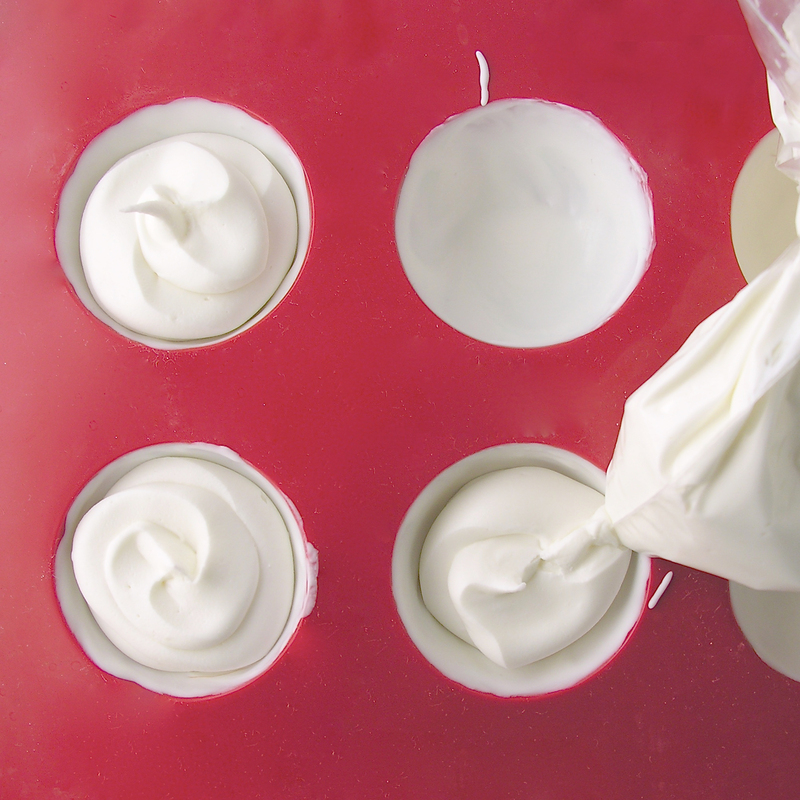 Use a pastry brush to brush melts into a chocolate bomb mold and freeze for a couple minutes until hard. Place filling into a large zip-top bag and seal tightly. Cut a corner off bag and pipe mint filling into each white shell- filling them about 3/4 full. 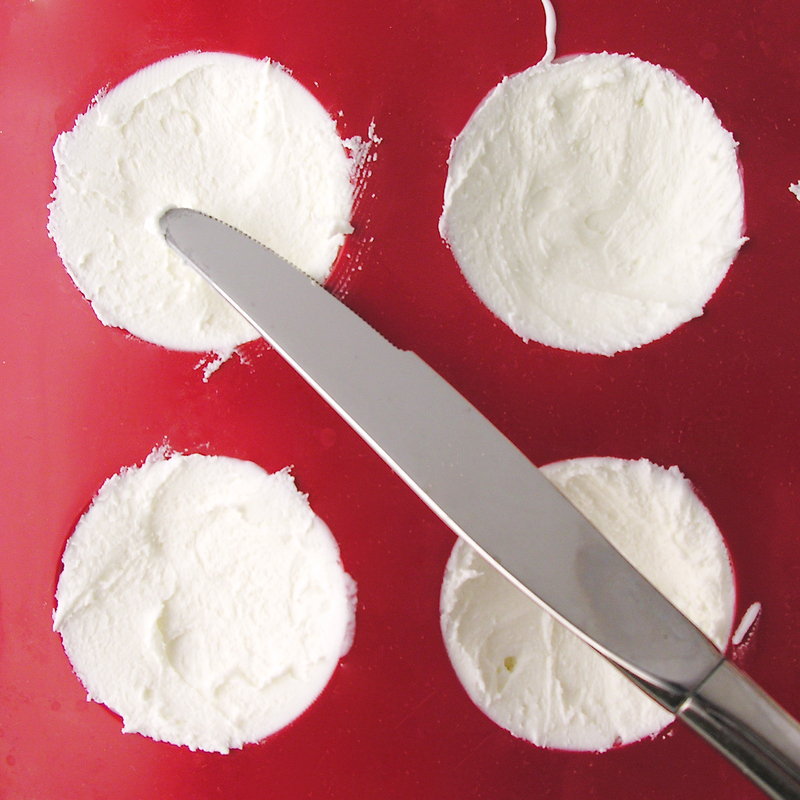 Use a knife to spread mint filling to edges. It will dip in at the center just a bit- and you want this. If it is full all the way across it doesn’t settle on the curved top of the brownie well (see the gap along the bottom in the below photo). Refreeze these for a few minutes before gently popping them out and setting them on a plate. Set aside until bombs ready to assemble. Assemble the brownies by spooning a little chocolate glaze on top of a brownie and spreading to all edges. 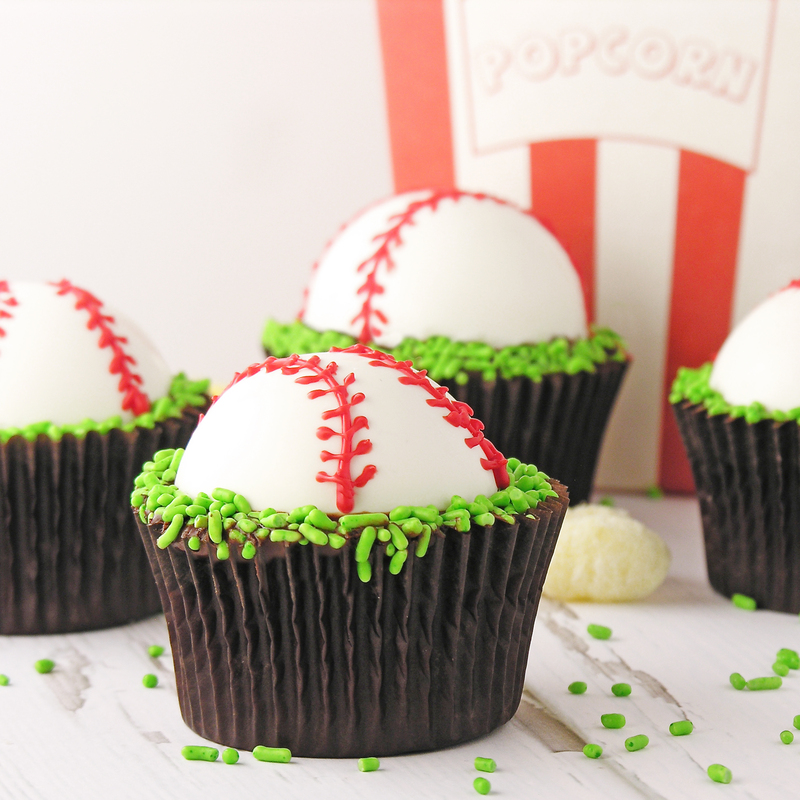 Place a “baseball” in the center and sprinkle jimmies around edge. Allow this all to harden up (refrigerate to speed process up). Place melted candy melts into a bag or squeeze bottle fitted with a tiny writing tip (I used a Wilton’s 1.5 size). Carefully pipe laces on top of baseballs (use photo as a guide) and allow these to harden. Store in a lightly sealed container for 3-4 days. Happy Father’s Day dad! Love you!!!!!! 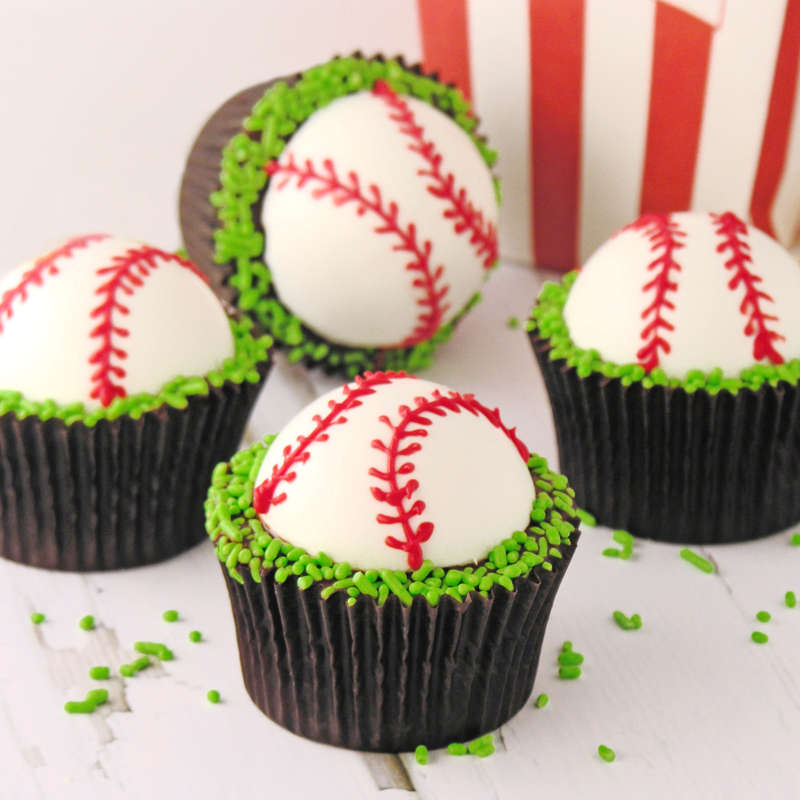 Posted in Brownies, Candy, Cupcakes and tagged baseball brownies, baseball cupcakes, baseball dessert, baseball dessert for dad, baseball party recipe, baseball recipe, brownie cup recipe, dessert for dad, dessert for fathers day, fathers day dessert, mint brownies, mint cupcakes, peppermint brownie cups, peppermint recipe, sports dessert recipe, sports recipe. Bookmark the permalink. 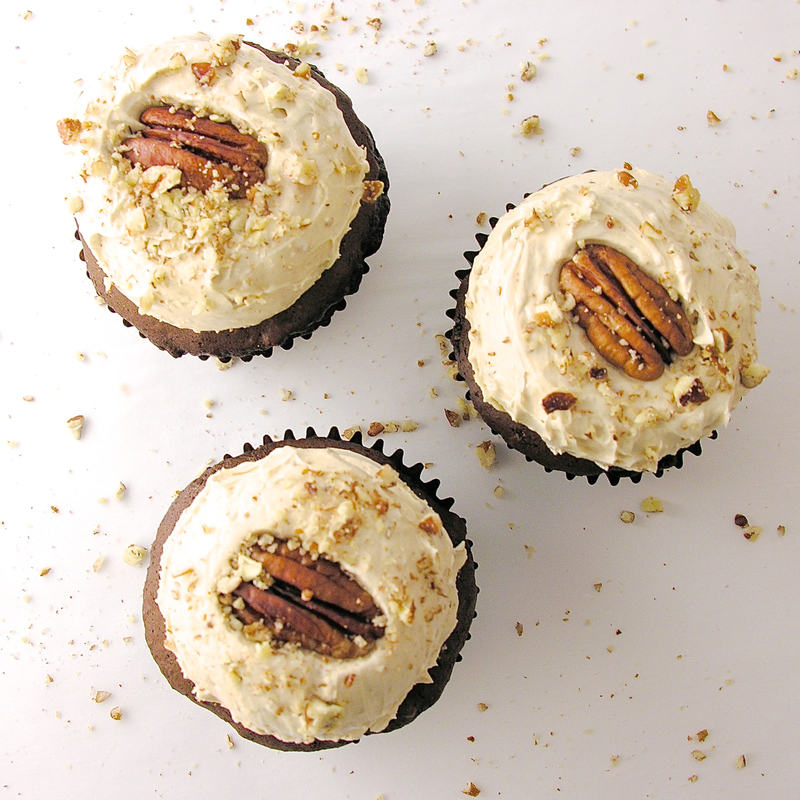 These wedding cupcakes are made with a mix- but a “made-over” mix. 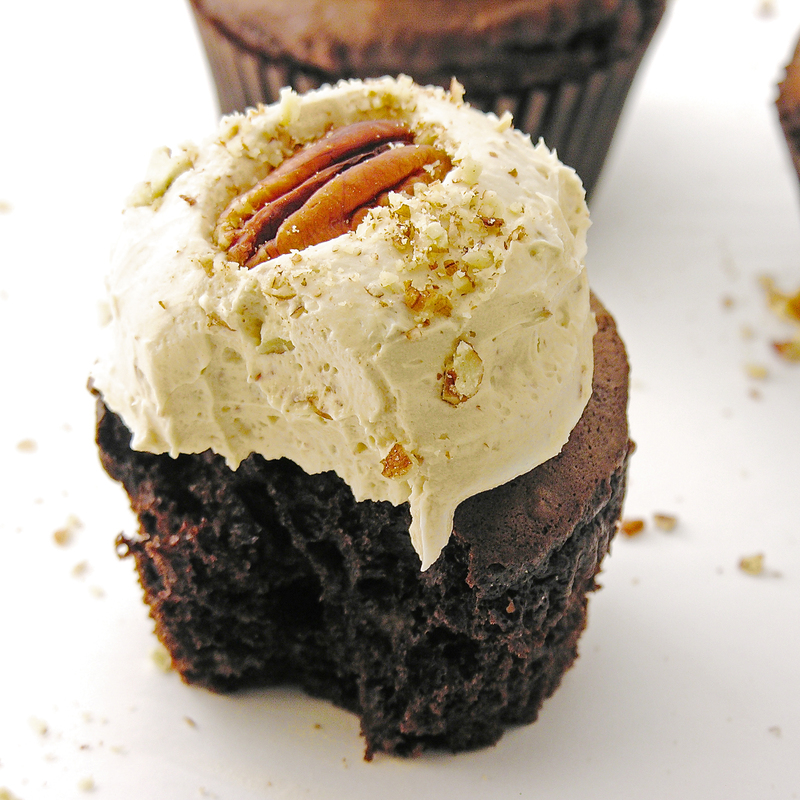 They are the most dense, moist and delicious cupcakes ever- you’d never guess they aren’t 100% made from scratch! 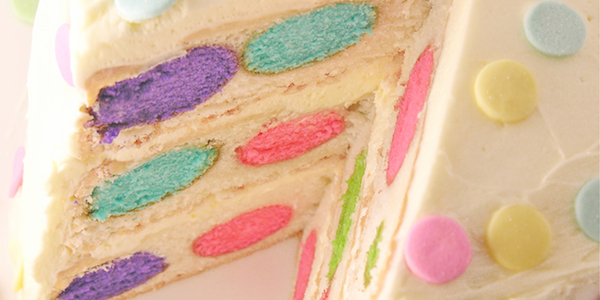 Have you ever heard of a “cake-over”? 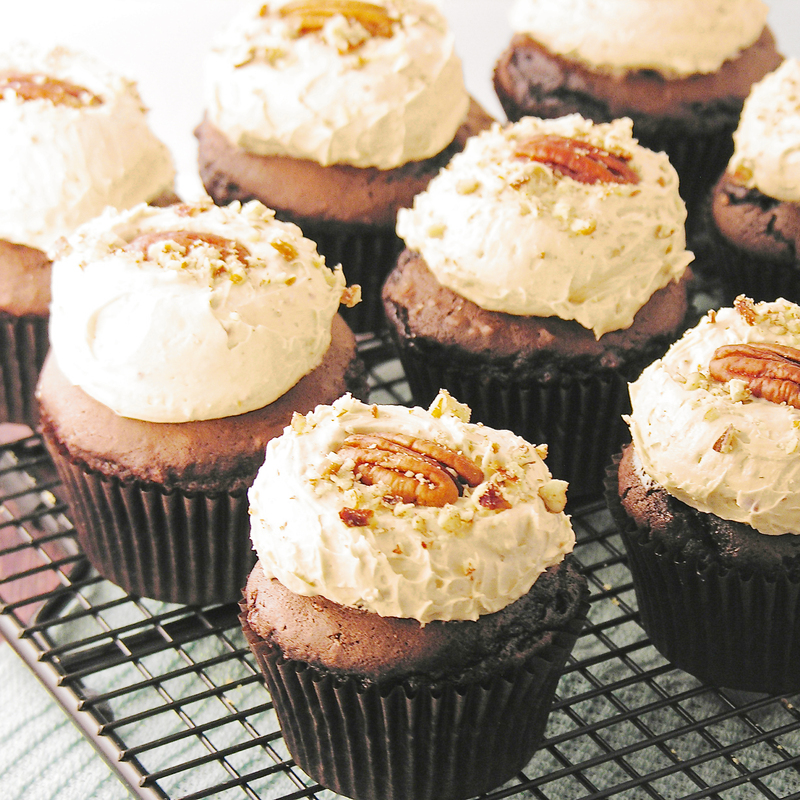 It’s when a cake mix has a make-over into a recipe that tastes completely made from scratch. 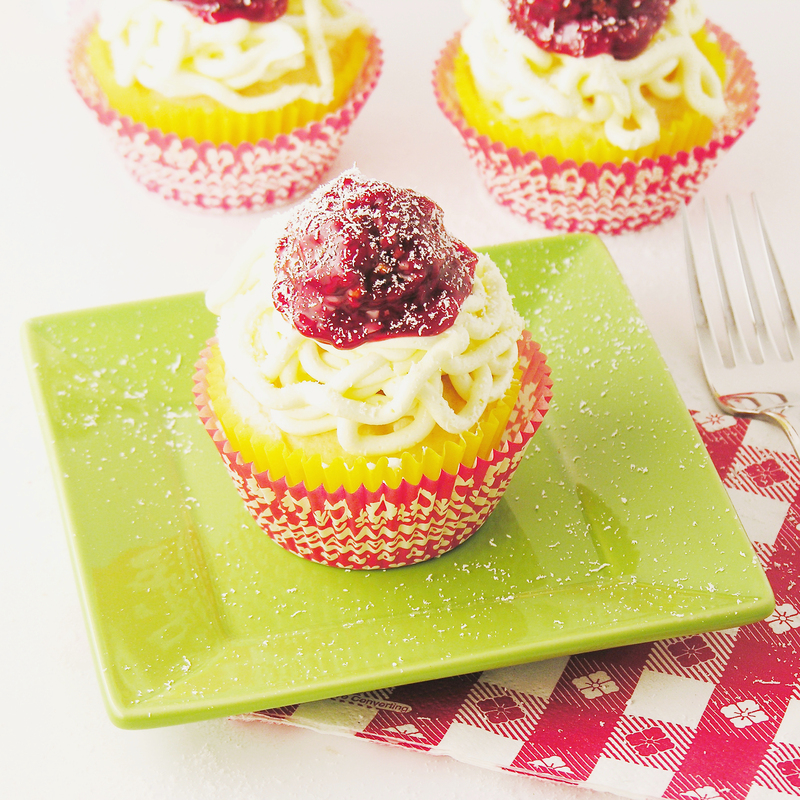 I’ve tried lots of these, and I actually love them- but I’d never found one for plain white cake that I liked. I was invited to bake wedding cupcakes for my friend Shanell this summer and I decided I’d better figure out a fix before then! Here’s my secret: white chocolate pudding. I use this flavor all the time in other recipes, and it is AMAZING. I also have used pudding mix in cake-overs before, and this pudding is WHITE- so it doesn’t change the color of your cake! 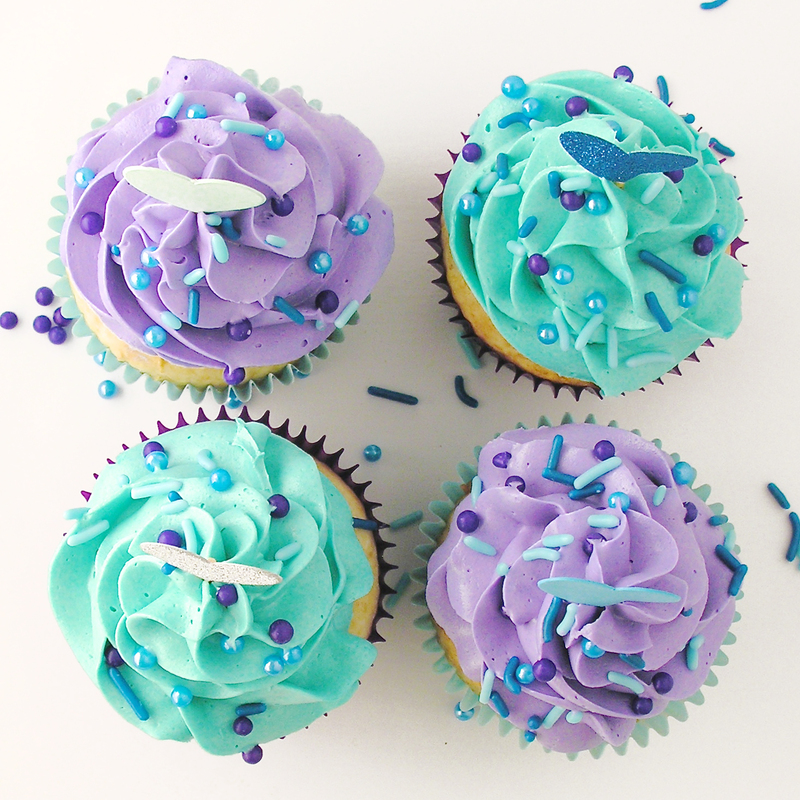 Shanell’s colors are teal and purple, so I practiced my decorating on these. Aren’t they fun?? Food coloring gels, and sprinkles as desired. 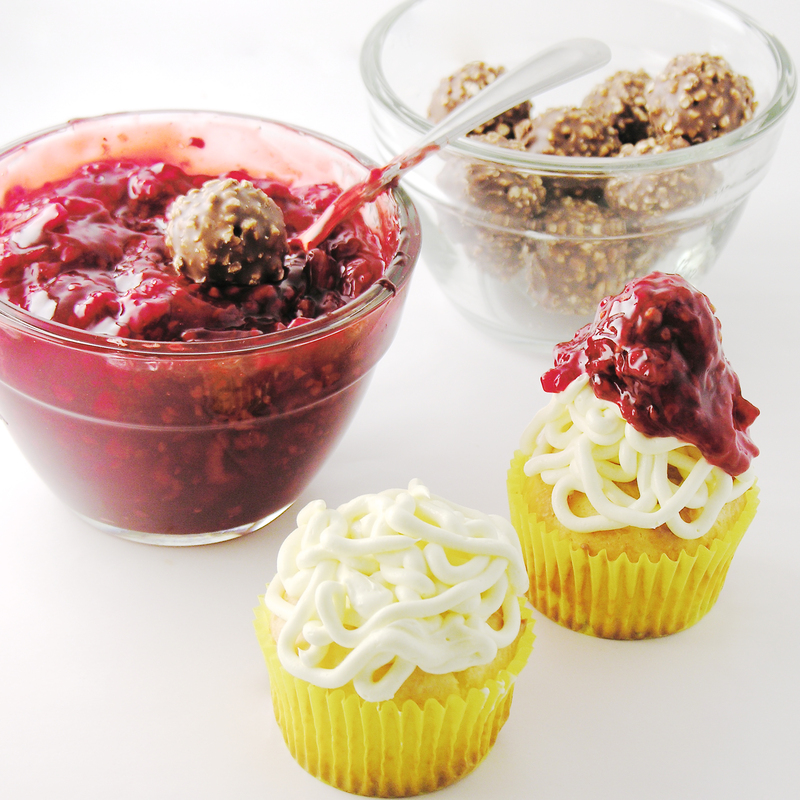 Combine cake mix, pudding, milk, oil, and egg whites in a mixing bowl and beat on high for 2 minutes. 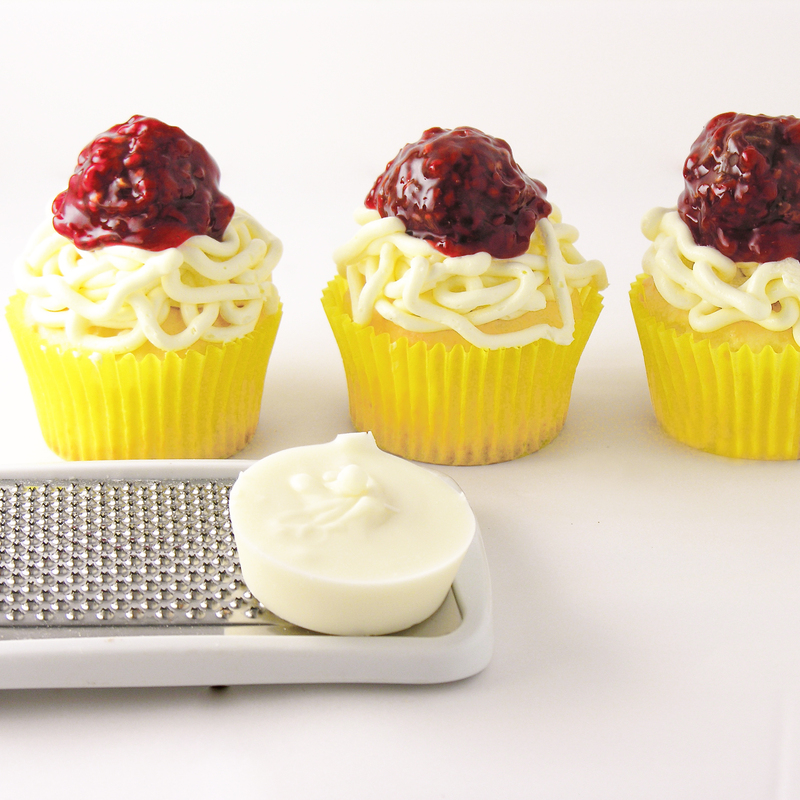 Evenly divide into 24 cupcake liners placed in tins and bake for about 18-20 minutes at 350F degrees. 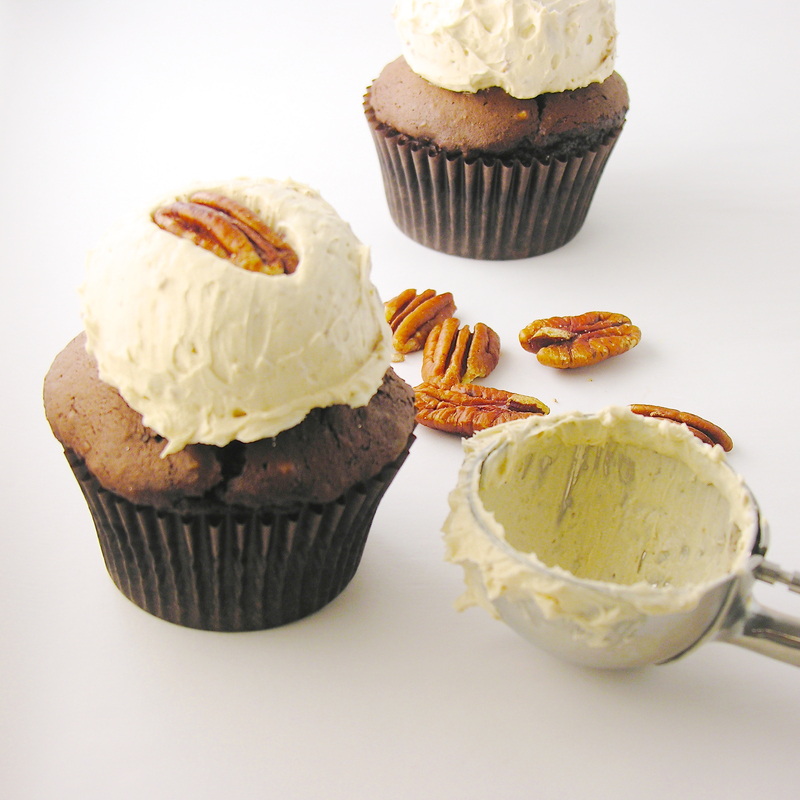 Make frosting by combining butters, vanilla and powdered sugar in a large mixing bowl. Add coloring if desired (if you want pure white frosting you’ll need to add white food coloring to off-set the yellow tinge given by the butter), and mix well. 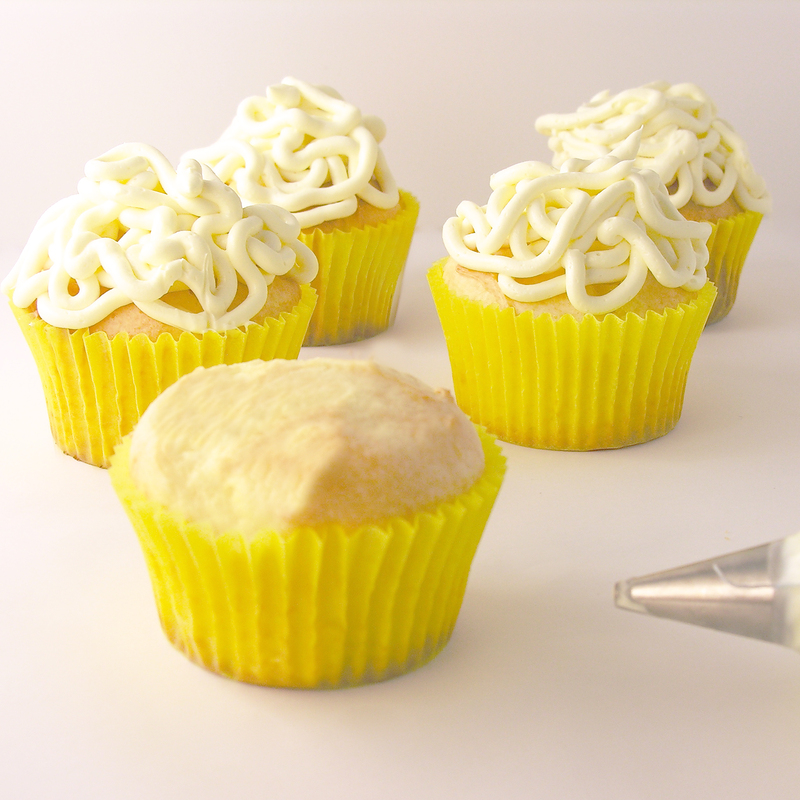 Place a decorating tip in the corner of a large zip-top bag, fill with frosting, seal well, and pipe frosting on top of each cupcake. 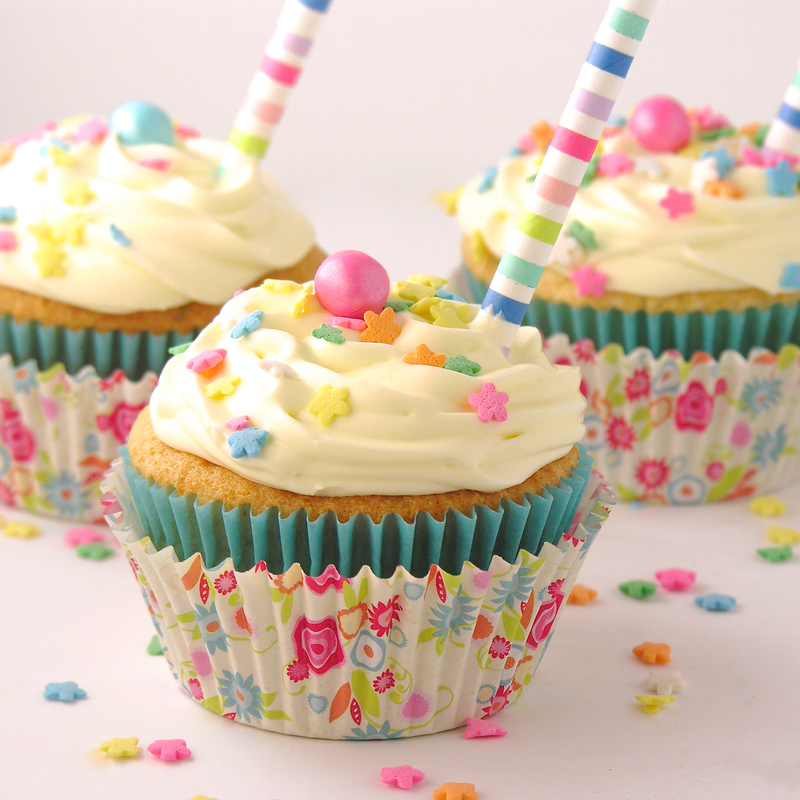 I used these cupcake toppers (aren’t they SO cute?!?) 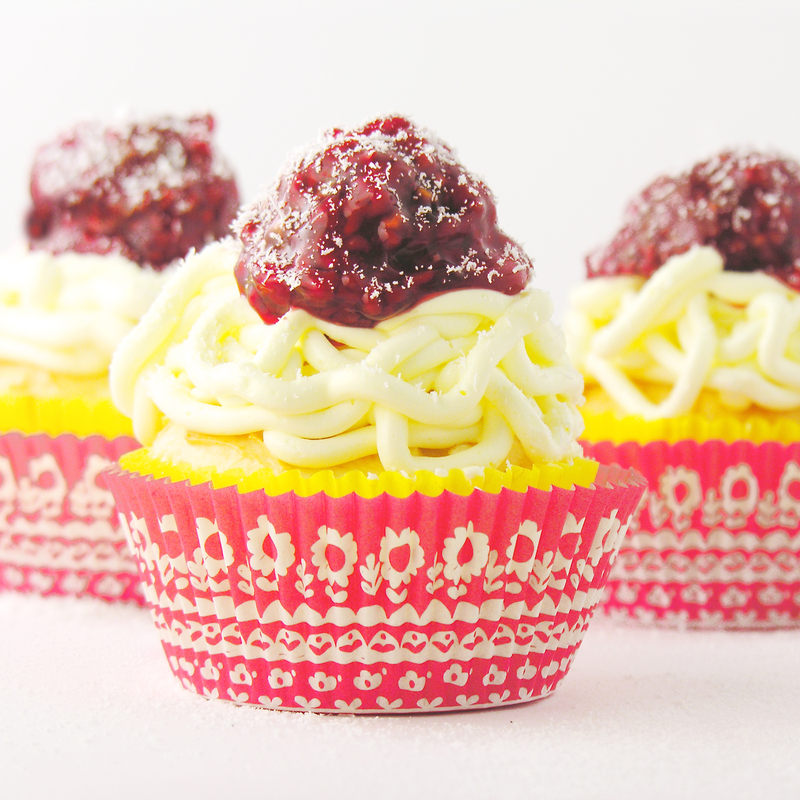 and these sprinkles. 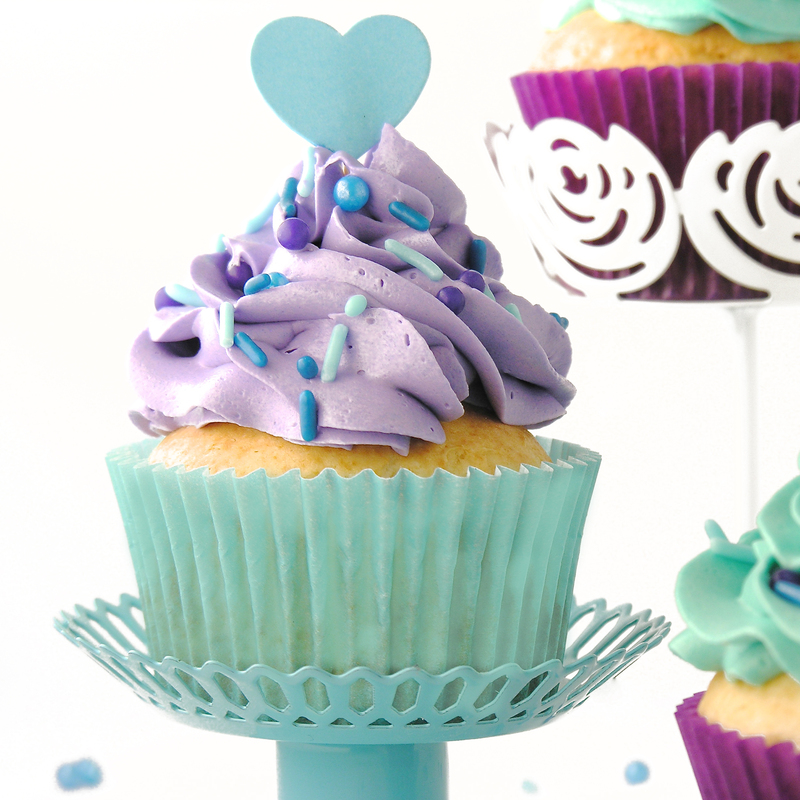 Posted in Cupcakes and tagged cake mix fix, cake mix fix for white cake, cake-over, cupcakes, purple wedding cupcakes, teal wedding cupcakes, vanilla cupcakes, wedding cake buttercream, wedding cupcake decorating ideas, Wedding cupcake ideas, wedding cupcake toppers, wedding cupcakes, white cake-mix make-over, white chocolate cupcakes, white wedding cupcakes. Bookmark the permalink. 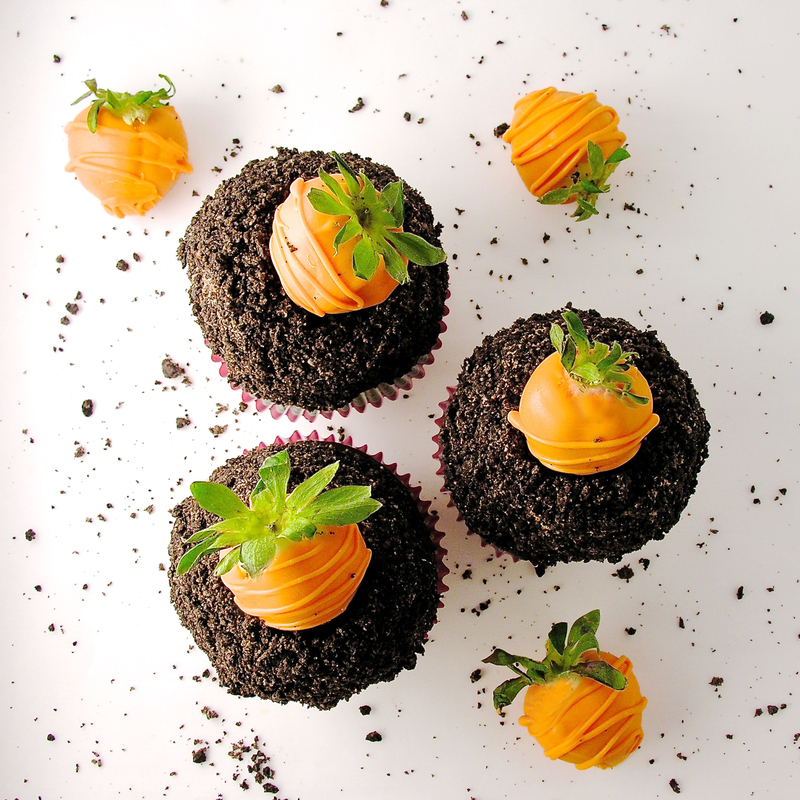 Delicious strawberry “carrots” buried in Oreo buttercream frosting- a perfect cupcake for Easter! Wash and thoroughly dry 24 strawberries. 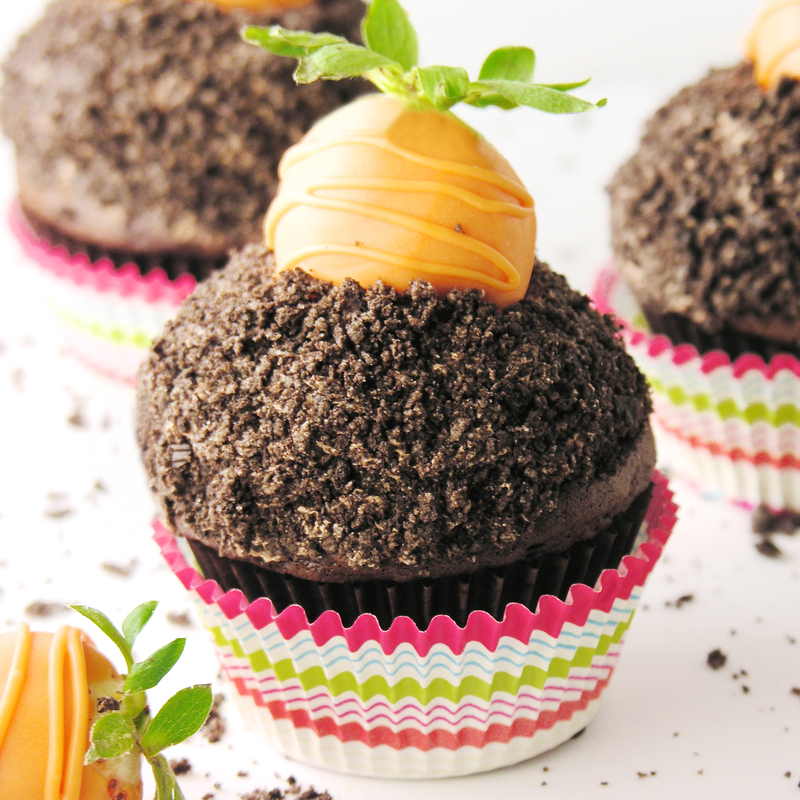 Make carrots by melting Candy Melts in microwave in 30 second increments, stirring in between until melted and smooth. Lay parchment paper or wax paper on countertop. 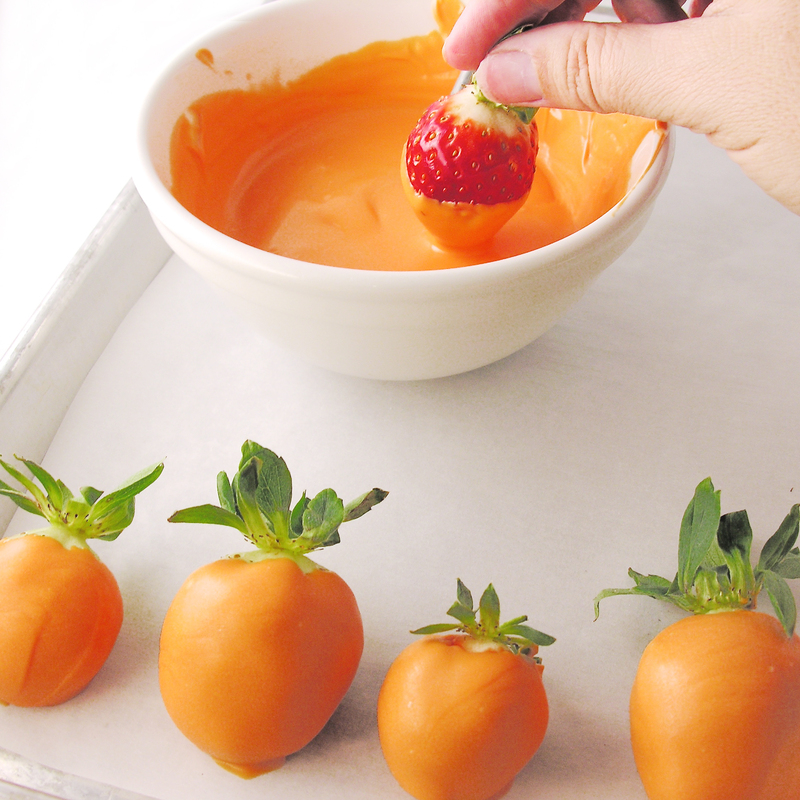 Grasping a strawberry by its stem and leaves, dip it into candy melts, spooning melts as close to stem as possible. Set covered strawberry on paper to harden. 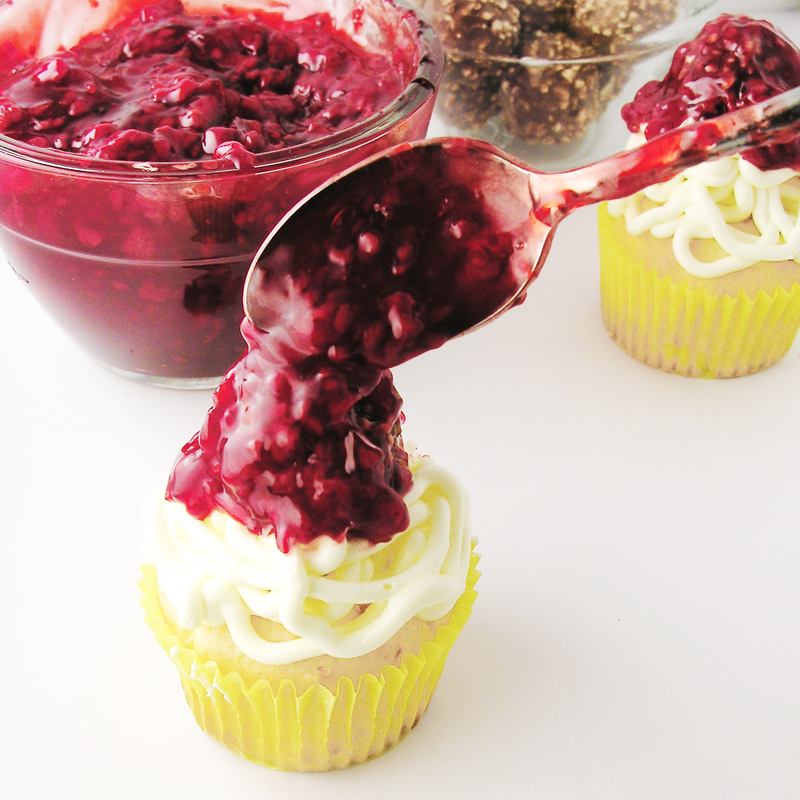 Once all berries are covered, spoon remaining melts into a zip-top bag and seal. Clip a corner and drizzle lines over the top. 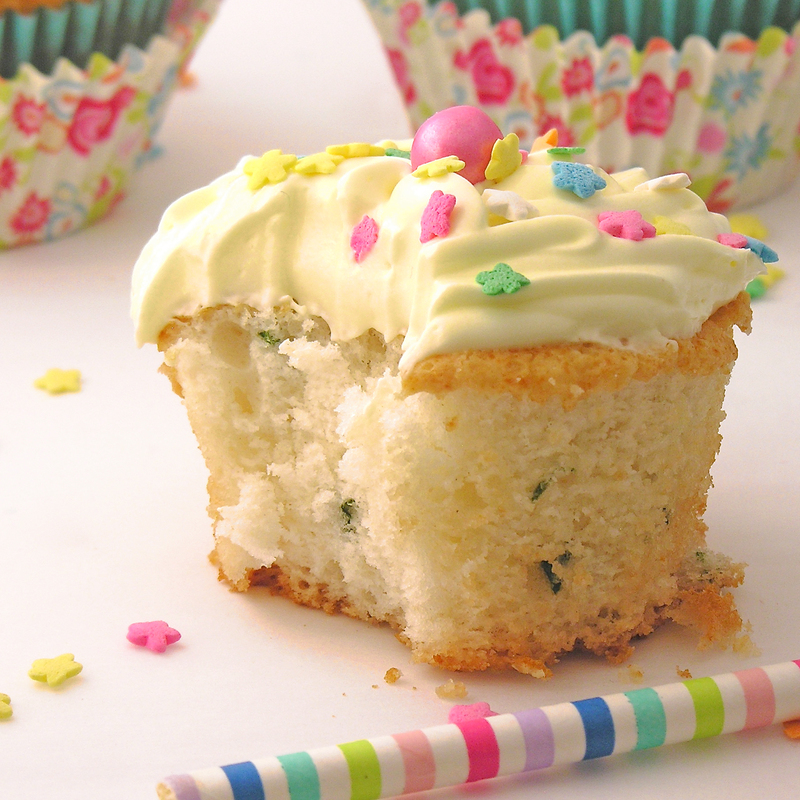 Prepare cake mix as directed and divide evenly into 24 cupcake liners in tins. Bake according to package and cool completely. 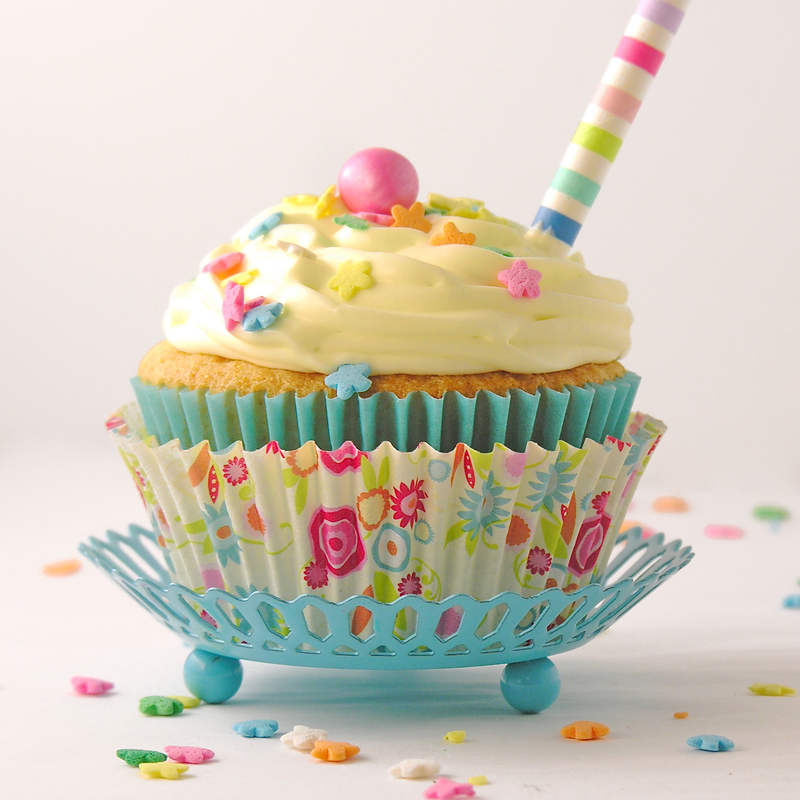 Make frosting by adding butters, powdered sugar and vanilla to a large mixing bowl and beating on high until light and fluffy (3-4 minutes). 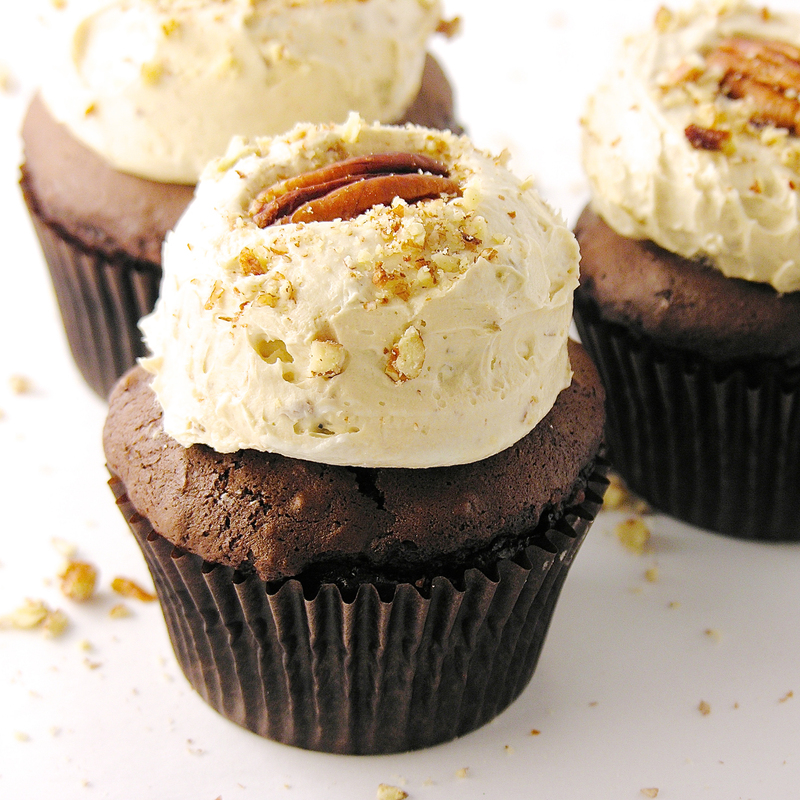 Add cocoa powder to frosting and beat on high until well- combined. 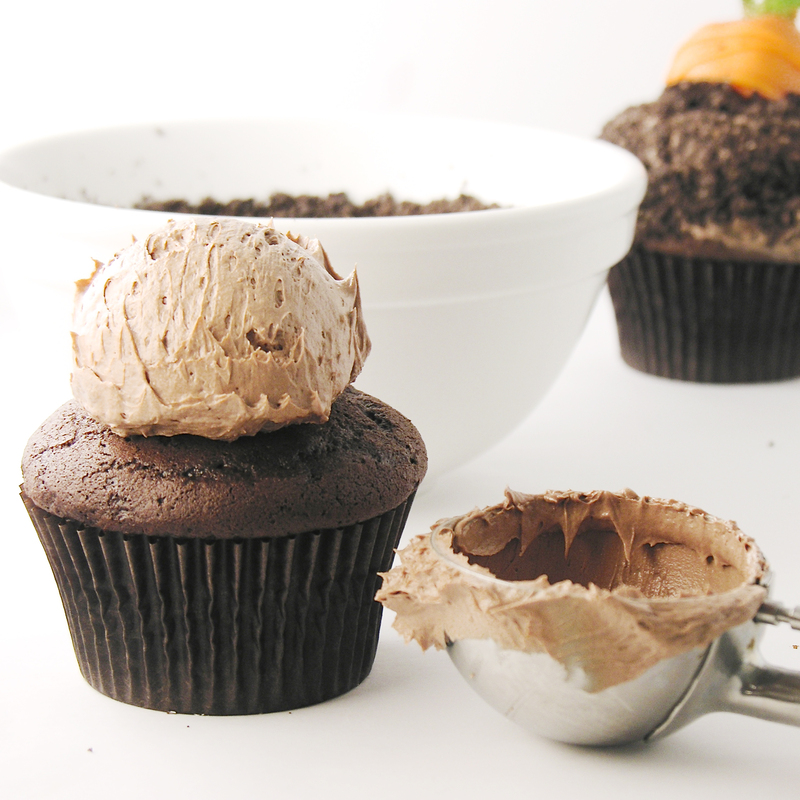 Use a cookie scoop, or ice cream scoop to place a scoop of frosting on top of each cupcake. 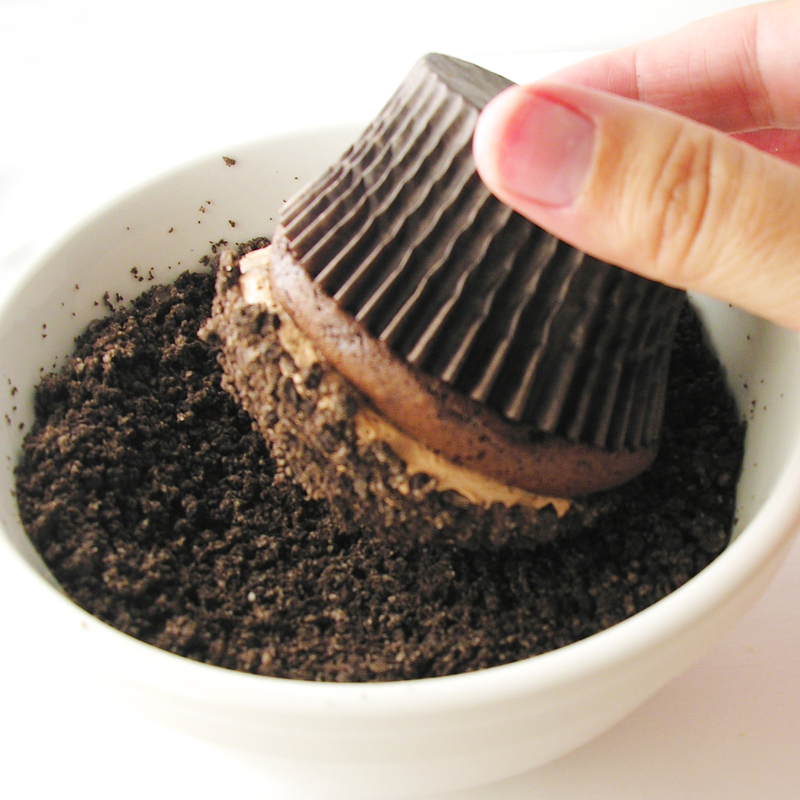 Press this into a bowl of Oreo crumbs, turning the cupcake to make sure all edges are covered. 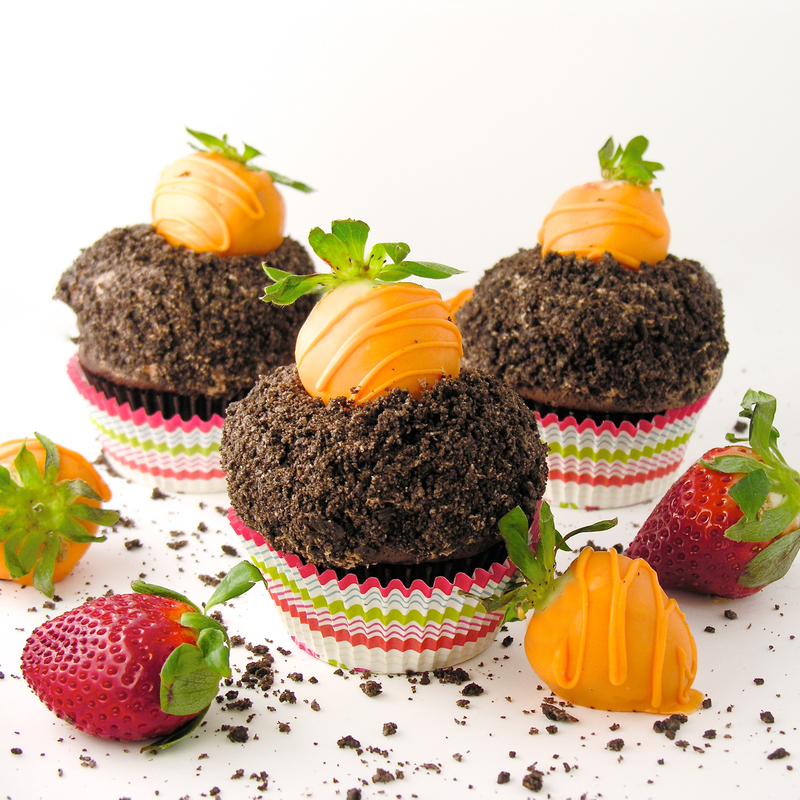 Press a strawberry “carrot” into the center of each cupcake and spoon a few remaining Oreo crumbs over the bottom of the carrot, to cover it further. 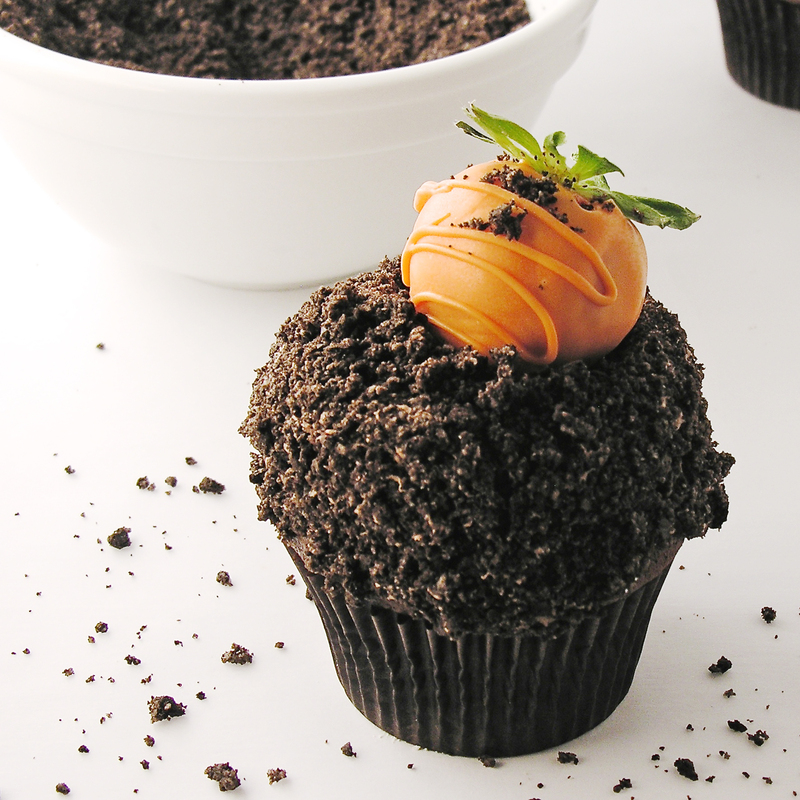 Posted in Cupcakes and tagged carrot cupcakes, chocolate buttercream, chocolate covered strawberries, chocolate Oreo cupcakes, cupcakes, easter cupcakes, Garden cupcakes, Oreo buttercream, Oreo dirt cupcakes, Oreo dirt cupcakes with carrots, Spring cupcakes, strawberry carrots, strawberry decorated like carrots. Bookmark the permalink. 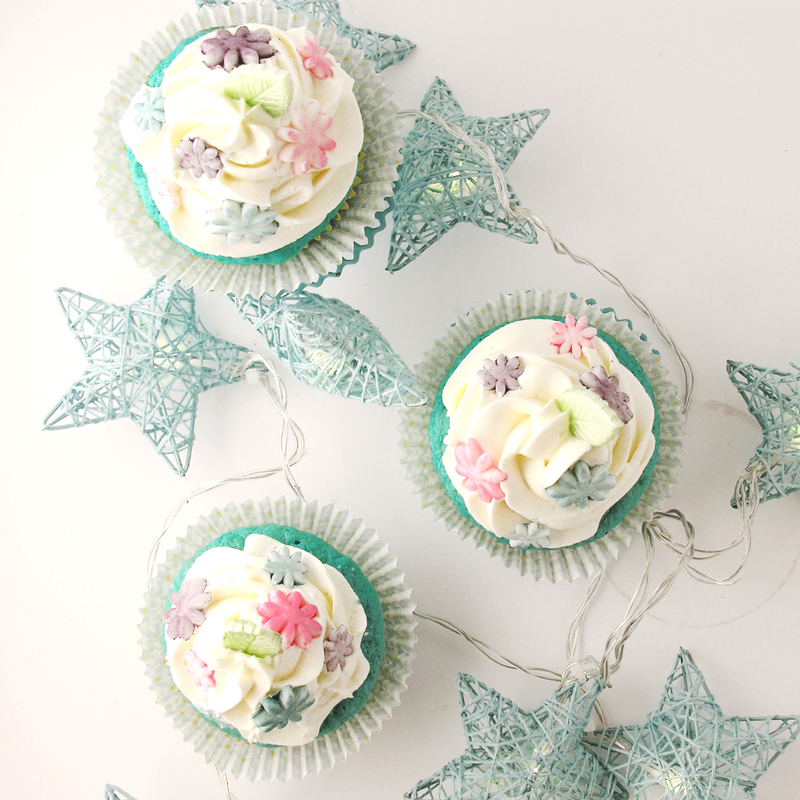 Blue velvet cupcakes topped with icy white buttercream and pastel shimmery flowers. Who says you can’t have a little summer in the middle of January? It was my birthday last week, and I treated myself to the COOLEST kitchen gadget ever- or so I thought. 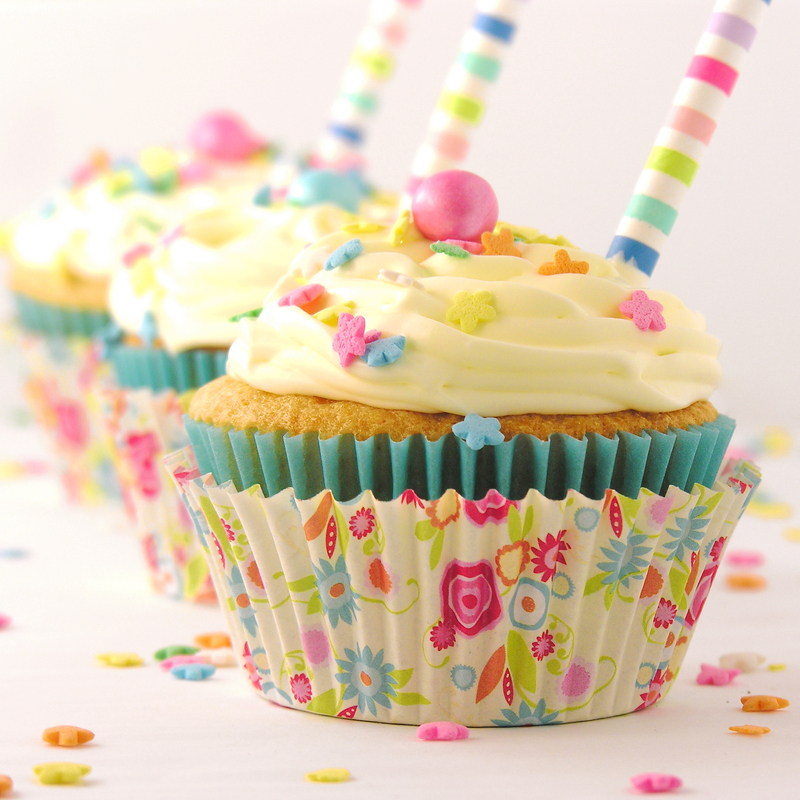 Have you seen the piping tips for frosting that make whole flowers? I saw this video and I was in AWE of these! I’ve never taken cake decorating classes, or ever really attempted frosting flowers, so these little tips seemed perfect for me! I got a set of 12 on Amazon and I couldn’t wait to try them! My goal? 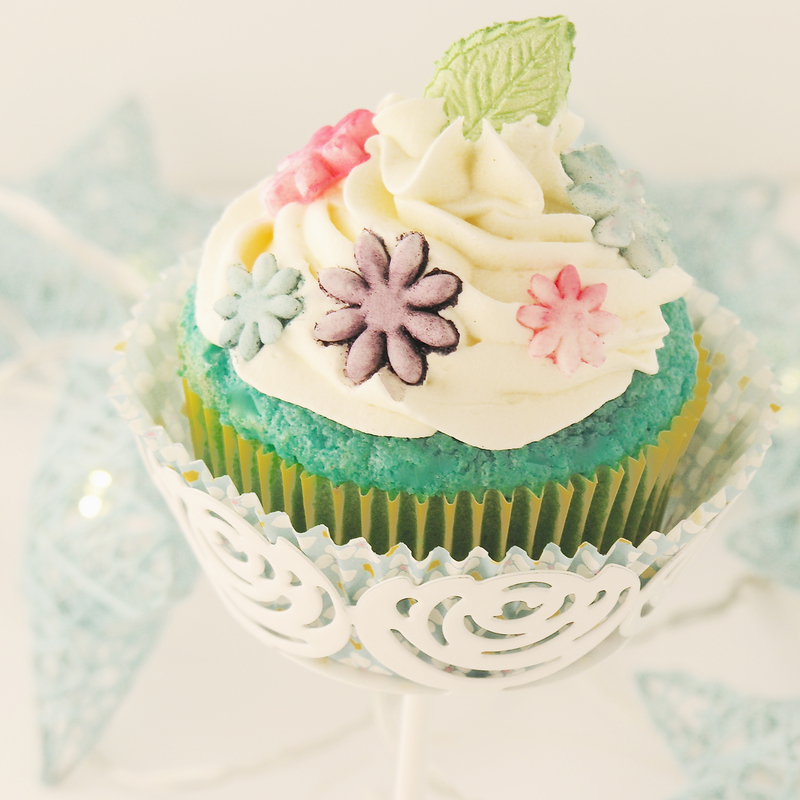 A variety of white buttercream flowers dusted in edible pastel powders- like ice-covered flowers- on each cupcake. The tips didn’t work. 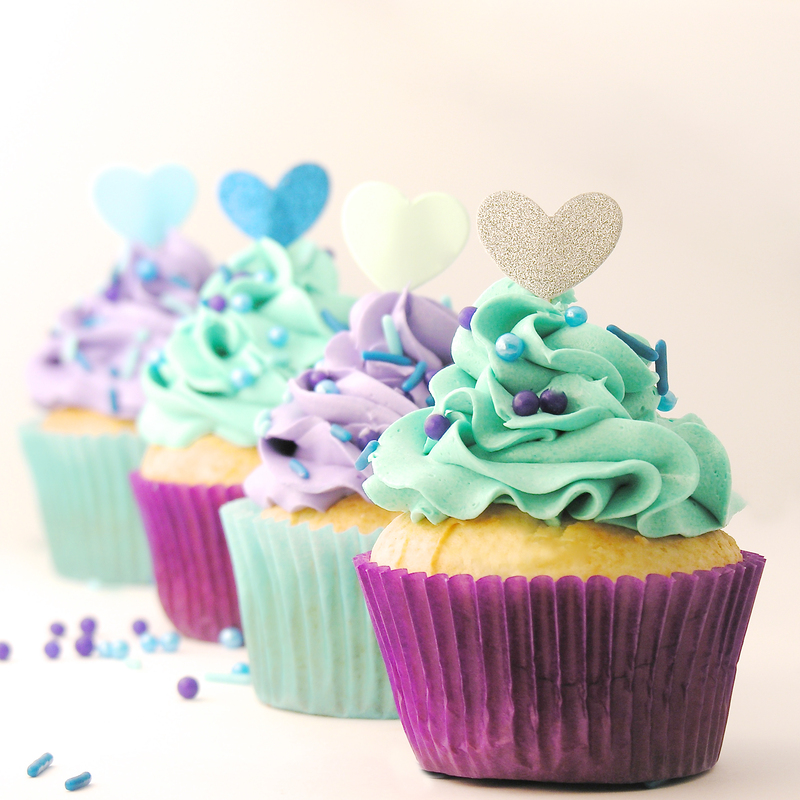 I tried a variety of frosting types and consistencies. I tried using the pastry bags included, I tried using a zip-top bag. Argh! Failure! If the frosting was whipped (my typical buttercream- light and fluffy) it did not keep it’s shape when piped. If the frosting was a nice firm buttercream it simply didn’t pipe out of the tip at all- and squeezing harder either forced a hole in the bag or forced the tip and connecter to separate from the bag. So, I had the cupcakes and decided to just go with what I had. Topped these with my very favorite buttercream and used a little fondant for the flowers 🙂 I think they are perfect! 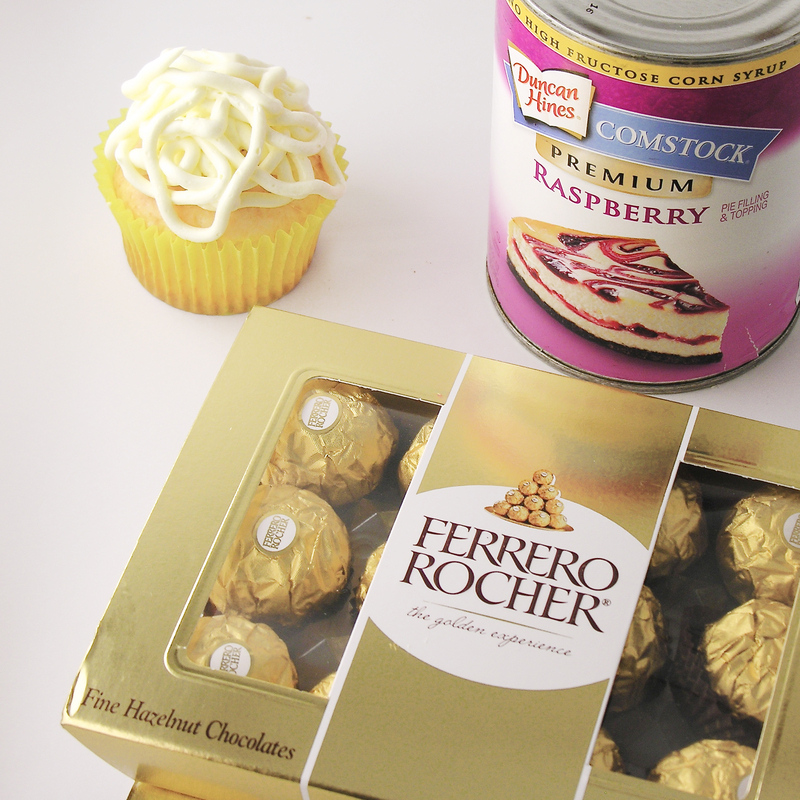 One blue velvet boxed cake mix- plus water, oil and eggs to make according to package. 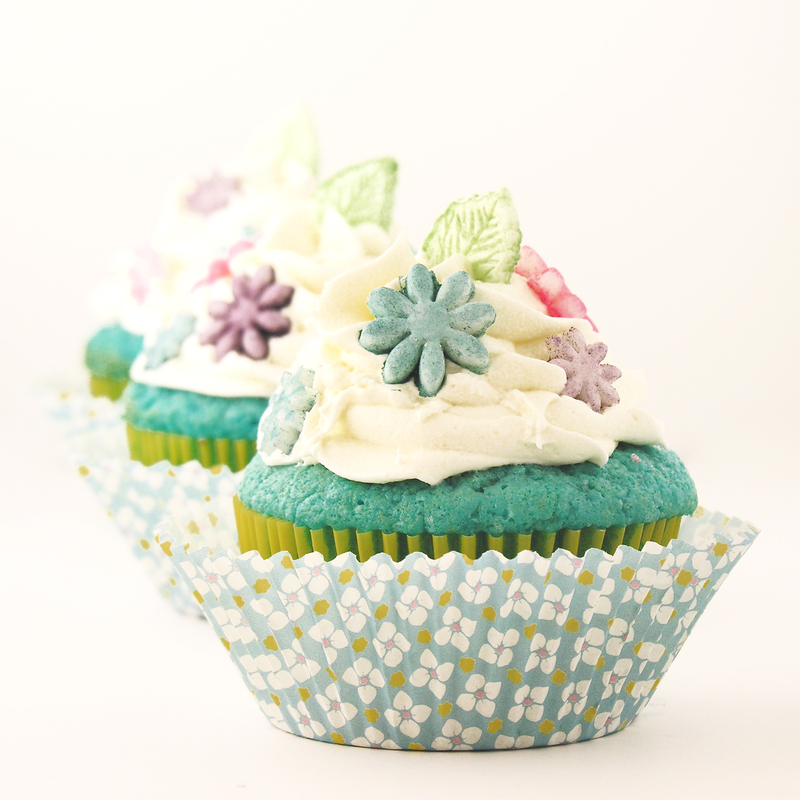 I used Duncan Hines to get this fun wintery blue color- and it was delicious!!! White fondant- I used a bit of Wilton’s boxed fondant, but you can make a little too- recipe here. 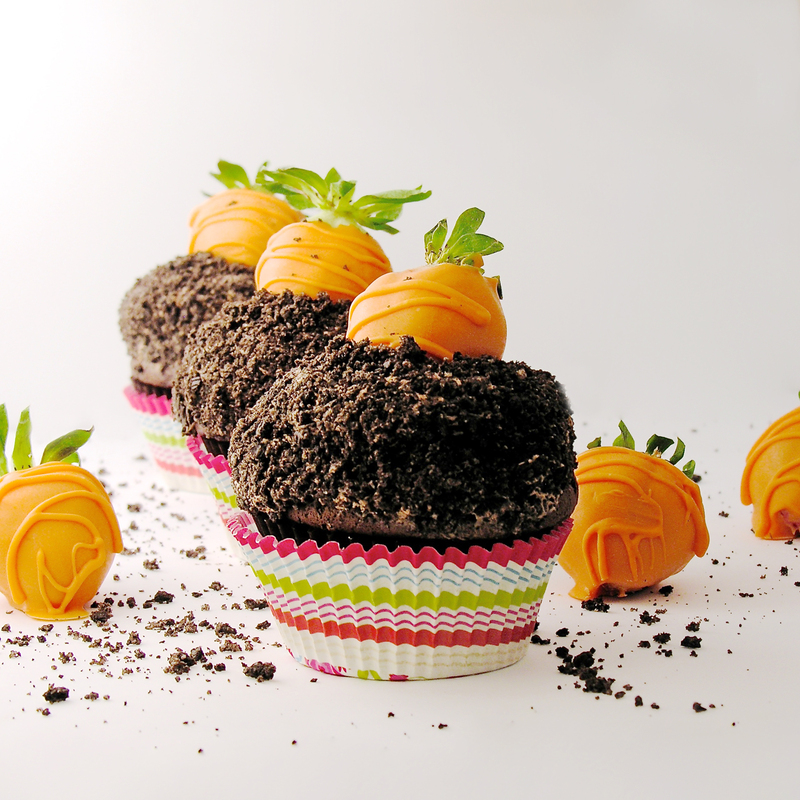 Make cake mix according to box and bake in 24 cupcake liners. Cool. Place butters, powdered sugar and vanilla in a large mixing bowl and beat on high until light and whipped (this takes 3-5 minutes, and it will whiten up considerably as you beat it. 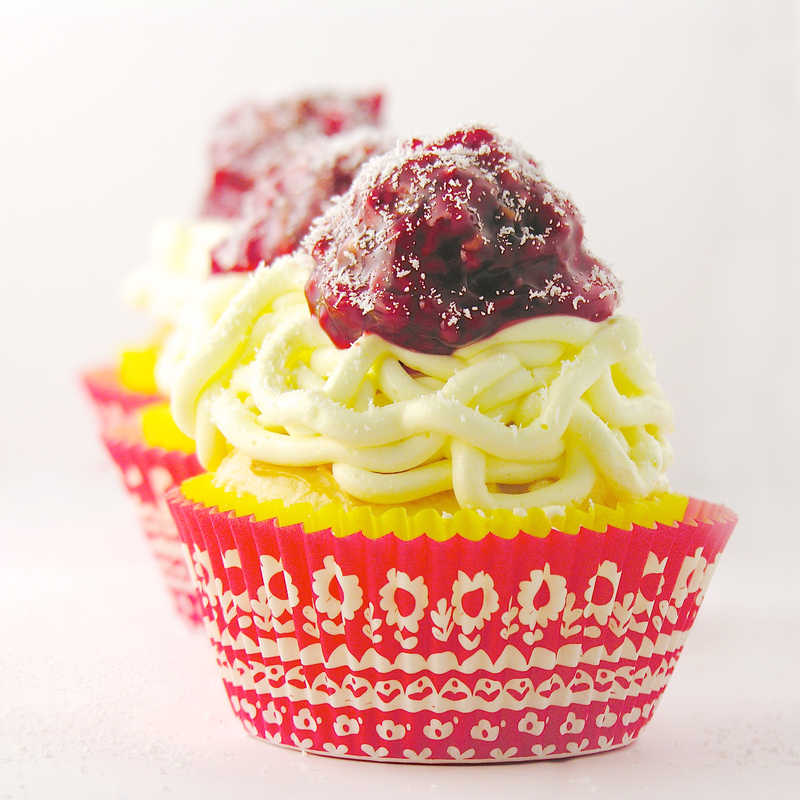 If you want it whiter, add a bit of white food coloring. 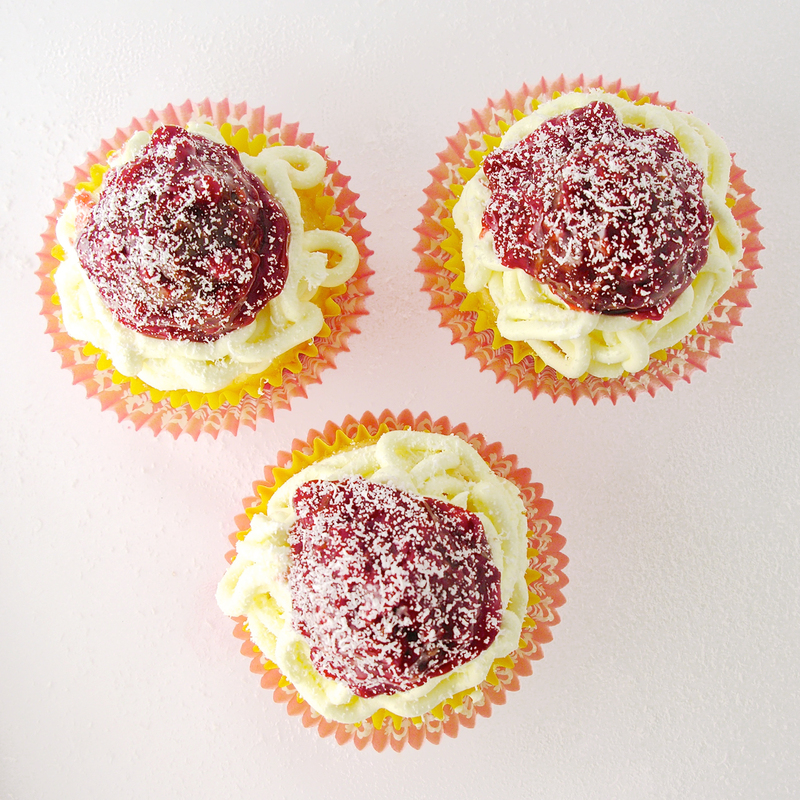 Place into a large zip-top bag fitted with a piping tip and pipe swirls on top of each cooled cupcake. To make flower decorations, roll fondant out and cut into leaf and flower shapes using small cookie cutters or fondant cutters. 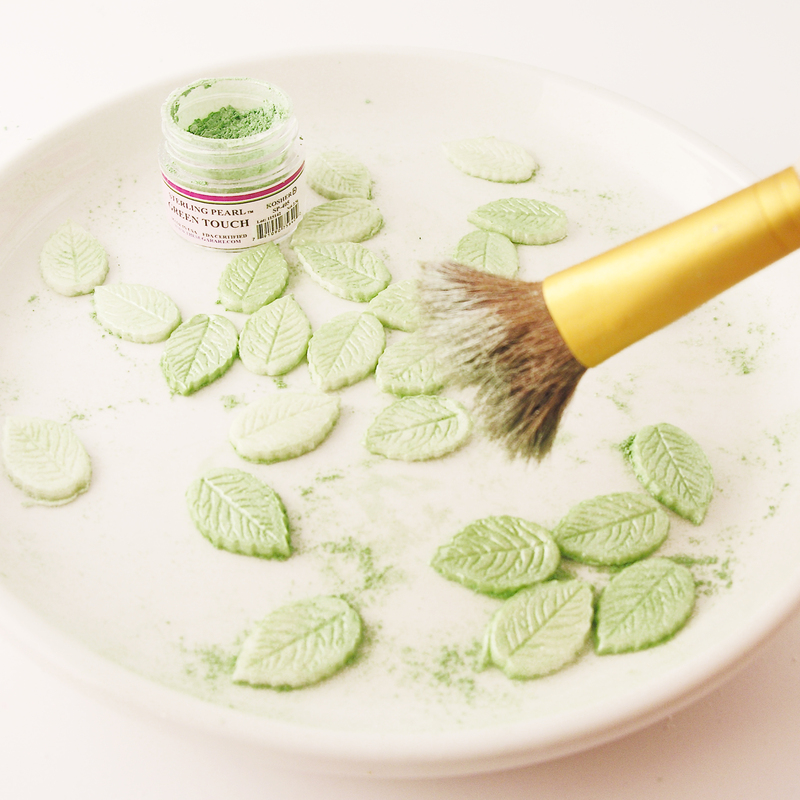 Dust leaves with edible green dust and flowers with edible pastel dust. I use a brand called “Sterling Pearl” and it comes in a wide range of colors, and is available on Amazon or many cake supply stores. 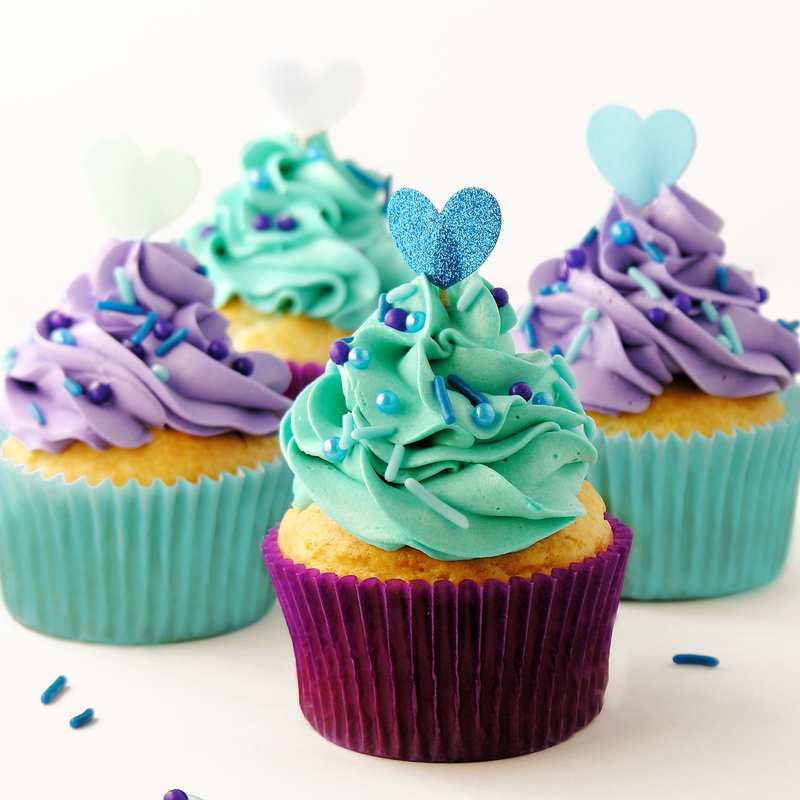 Place decorations on cupcakes and ENJOY!! 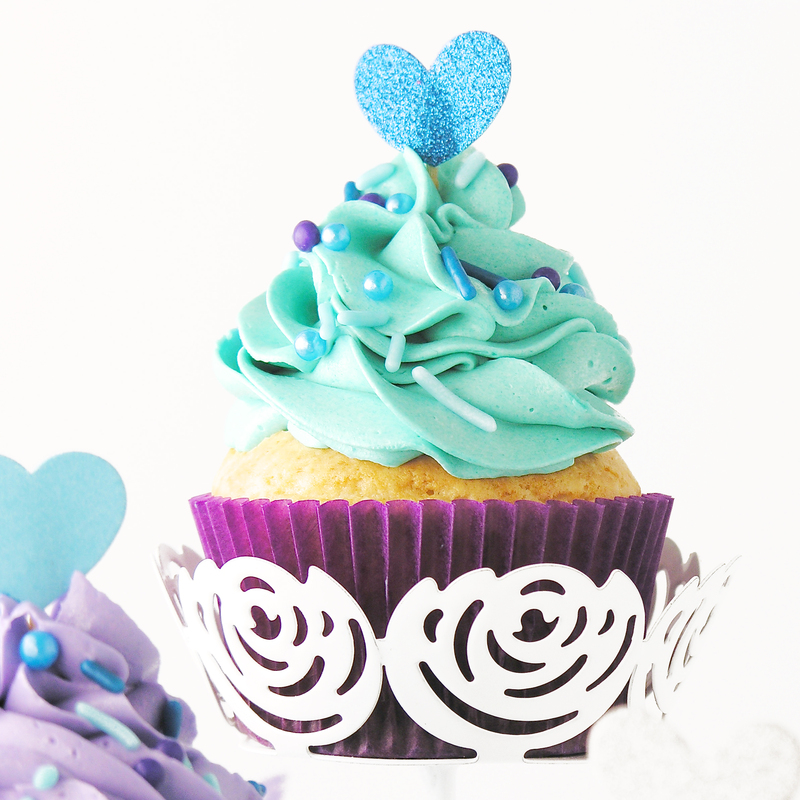 Posted in Cupcakes and tagged blue velvet, blue velvet cupcakes, cupcake, cupcakes, edible dusting powder, flower piping tips, fondant, fondant flowers, icy cupcakes, January cupcakes, January desserts, Russian piping tips, sparkling cupcakes, winter cupcakes, winter dessert, winter flowers. Bookmark the permalink.